At Taylor Creek Stables, we offer saddle seat riding lessons for riders 4 and over as well as driving lessons. to learn from that work with and challenge every type of rider from beginner to advanced, even physically challenged riders. At Taylor Creek Stables, we strongly believe in creating a fun and safe environment for our riders to learn and succeed. Whether you wish to ride with the goal of showing or just for pleasure and exercise, we will gladly cater to your needs. Riders of other breeds are also welcome to our program to fine-tune their skills. Lessons are given Tuesday-Saturday year round. Each lesson is approx. 30 minutes long and cost $40. Call Sena today to schedule your first lesson! and age have the opportunity to show our lesson horses throughout the summer alongside our show team. We encourage those showing in the summer to become ASHAM members to be eligible for ASHAM's High Point Awards. At the end of each year points are tallied based on how each rider performed and awards are given to those who accumulated the most points! Follow this link to learn more about ASHAM and become a memeber! The Michigan Instructor's Association shows are held once a month throughout the winter and are a fantastic opportunity for riders, from beginner to advanced and of any age, to showcase and fine-tune their riding and showing skills. 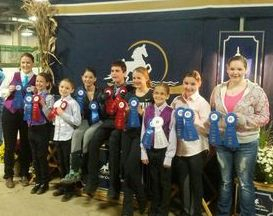 Taylor Creek Stables participates in, and hosts, the competitive and fun MIA Winter Academy Shows from December - April. In a fully heated facility with world-class competition, the MIA shows provide a fun atmosphere for riders to perform! 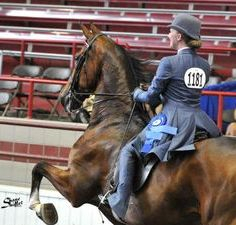 Learn about the American Saddlebred!